There are over 70 languages spoken in Pakistan in addition to those used by migrants and refugees from surrounding countries. Urdu is the national language but while many know it as a second language it is only used as a first language by less than 10% of the population. English has also been an official language until moves by the government in 2015 to replace it. 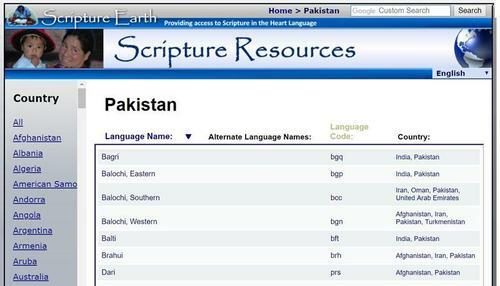 ScriptureEarth lists over 20 languages for Pakistan (excluding English). Some have full Bibles, some only short tracts. Popular Bible apps from YouVersion and Bible.is include scripture and video products in many of these languages.